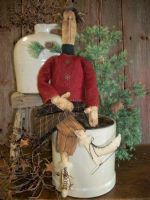 29" Chester is a charming little fellow! 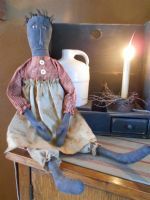 He is made of osnaburg fabric with a fabric stitched nose, snap & wool eyes and an embroidered mouth. 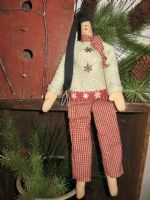 Chester is wearing a checked homespun shirt with brushed flannel homespun overalls. 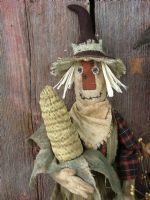 He is holding a cob of corn that is hand sculpted, painted and grudged. Chester is very heavily stained. 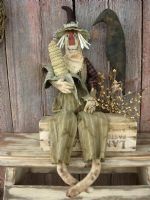 He can either sit or be hung up and is all ready to grace your prim home! $52.50. FREE SHIPPING IN 48 U.S. Others E-Mail me. 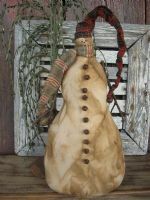 I offer $$ off average U.S. shipping costs.